(February 28, 2015) The Olympic Community of Schools will be hosting a "Career Speed Dating" event where 50 to 75 professionals will spend about 90 minutes speaking to teams of 3 to 5 teens in about 5 minute segments. Students rotate after each 5 minute segment. Olympic is looking for volunteers who can speak to the students about their experiences in the workforce and help prepare them for their futures. If you can help, please contact Mike Realon at 980-343-3800 Extension 4006163 or michael.realon@cms.k12.nc.us as soon as possible. Volunteer Responsibilities: Professionals will speak to a team of 3-5 students for about 5 minutes. Then a new team of students will come to your table. Four million jobs are unfilled in the American workplace due to a skills gap created by a misunderstanding of 21st Century workplace needs. 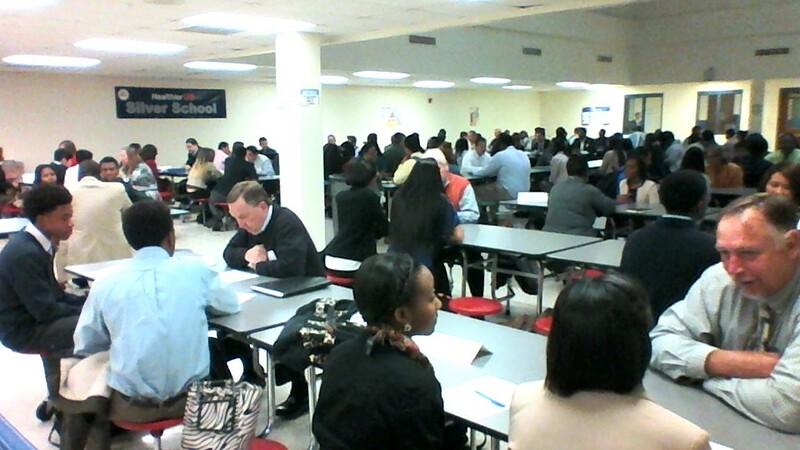 Last November the Olympic Community of Schools collaborated with local business professionals to expose its students to a vast variety of careers and their prerequisites by using a “speed dating” format. About 50 professionals took turns meeting individually with small groups of students to answer questions about how to obtain successful careers. This was part of the school's strategy for developing “career ready” students.